San Francisco-based footwear brand Allbirds has opened in a retail space on one of the world’s trendiest areas — Toronto’s ‘West Queen West’, as the brand expands its Canadian presence after opening a Canadian online store in March of this year as well as two pop-ups at Nordstrom. The Queen Street pop-up is being used as a test to determine if the company’s next move will be permanent stores in Canada. Allbirds was founded by Tim Brown and Joey Zwillinger in 2014 — Brown is a retired professional soccer player from New Zealand with a degree from the London School of Economics, and Zwillinger is a biotech engineer and renewable materials expert. A Kickstarter crowdfunding campaign in 2014 kicked-off the brand with the campaign reaching over $100,000 in sales in just four days. Mr. Zwillinger’s background helped design the construction of the rapidly growing brand while introducing additional sustainable materials such as a vegetable oil-based polyurethane insole. In 2016, the business partners renamed the footwear brand as ‘Allbirds’ and introduced it to the world. Mr. Zwillinger explained that the Allibirds name is a historical reference to New Zealand having been so remote at one time that its only inhabitants were ‘all birds’. The company has since seen millions of dollars in venture capital for its expansion, with investors showing confidence in a brand that Time Magazine has named “the world’s most comfortable shoe”. “We always try to ﬁnd new uses for materials that naturally exist right in front of us, rather than relying on cheap synthetics like traditional footwear brands. With a focus on developing on what we call the ‘right amount of nothing’, we are taking the core function of shoes and distilling it to its minimum which results in shoes that look great and feel amazing throughout the day,” said Mr. Zwillinger. The Toronto pop-up will be open until August and it’s located in an area that Vogue Magazine declared in 2014 to be ‘the second-coolest’ in the world. The ‘West Queen West’ area, as it’s called, features a mix of local, national and international brands, and is known to be a launch point for trendy retailers that want to open their first Canadian store in a place that isn’t Yorkdale Shopping Centre. 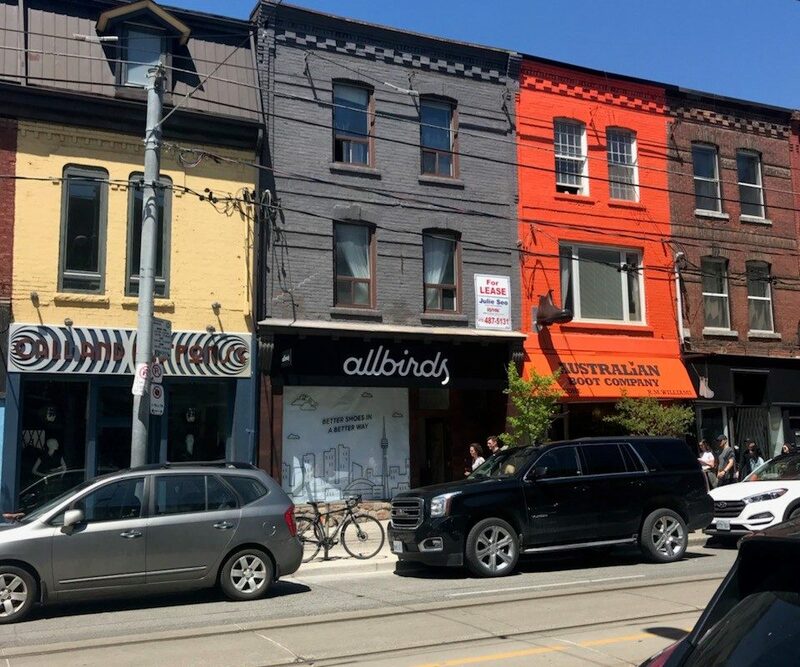 The lease deal for Allbirds at 700 Queen Street West was handled by CBRE Toronto’s Arlin Markowitz and Jackson Turner. The pop-up was conceptualized and executed by Community Agency alongside the Allbirds team. Allbirds launched its Canadian expansion in the spring of 2017 with an e-commerce site dedicated to the Canadian market, as well as pop-ups at Nordstrom’s Canadian flagships at CF Pacific Centre in Vancouver, and at CF Toronto Eaton Centre in Toronto. The Queen Street pop-up will further allow Allbirds to test the waters in Canada, according to Mr. Zwillinger — Allbirds doesn’t wholesale in multi-brand retailers, instead opting for a direct-to-consumer retail model. Permanent stores could eventually open in markets such as Toronto and Vancouver, he noted. Similar pop-ups are currently activated in New York City and San Francisco, and those and other US markets could eventually see permanent Allbirds retail spaces.